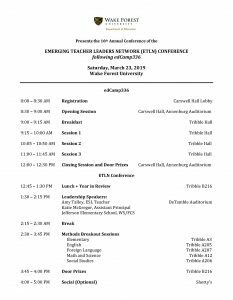 Each year the Department of Education hosts the Emerging Teacher Leaders Network (ETLN) Conference, which invites alumni to return to Wake Forest University for a time of professional development, collaboration, and networking. For the past fifteen years, the ETLN Conference took place on MLK weekend in January. This year, the annual conference will move to a new date and time as we strive to connect multiple department initiatives under a single roof to better accommodate the needs of local teachers as well as Department of Education alumni, students, and faculty. 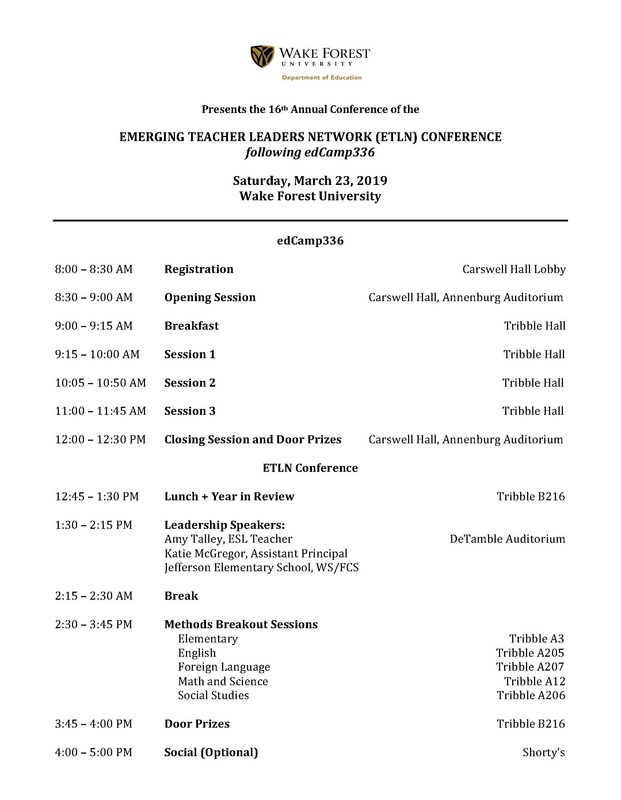 The 2019 ETLN Conference will be held on Saturday, March 23, in Tribble Hall. All Department of Education alumni are invited to attend. ALUMNI, PLEASE RSVP FOR THE ETLN CONFERENCE HERE! The ETLN conference follows edCamp336, which is a morning of professional learning hosted by the Department of Education in collaboration with Winston-Salem/Forsyth County Schools. edCamp336 is open to all local teachers as well as Wake Forest students and alumni. This “unconference” will take place on the morning of March 23 from 8:30 am to 12:30 pm. Registration information for edCamp336 can be found here. Amy Talley started her teaching career in 1997. Since that time she has taught in many different schools and worked with students aged two to adult. Her time as a graduate student at Wake Forest University deepened her understanding of K-16 Spanish education and renewed her desire to teach Spanish. 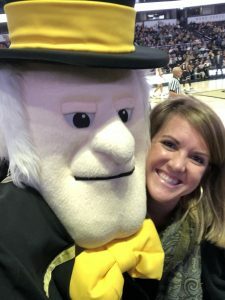 Amy taught elementary Spanish for seven years after graduating from Wake Forest and led the Wake Forest Spanish Immersion camp for ten years. She received the Marcellus Award for Excellence in Teaching and National Board Certification in 2010. Amy returned to teaching ESL in 2013 and now teaches at Jefferson Elementary School, where she received the Winston-Salem/Forsyth County Schools Teacher of the Year award in 2018. Katie McGregor began her teaching career in Winston-Salem/Forsyth County Schools in 2005. She taught at Lewisville Elementary School as a kindergarten and 5th grade teacher. Later, she embraced the role of Instructional Facilitator at Diggs-Latham Elementary School where she supported teachers and developed her love for curriculum and instruction. 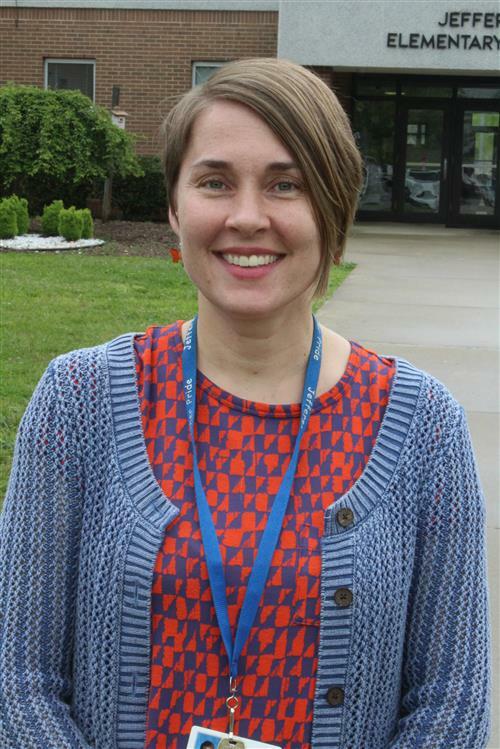 Currently, she is an Assistant Principal at Jefferson Elementary School, where leading and learning are celebrated. Katie attended Wake Forest University and majored in Elementary Education. She has a masters in Elementary Education and a masters in School Administration from Gardner-Webb University. Katie says it was at Wake Forest’s freshman orientation in 2001 that she received a t-shirt with this quote on the back of it: “Be not simply good, but good for something.” It is her hope for all of us immersed in teaching and learning that we strive to be good for something in all that we do.